So in the screenshot I see four clips or featurettes in the "Executive Washroom". Are these the same as the ones found on "Toxic Avenger 1"? Please update your specs with them. I was asking about "Take T.I.T. (Troma Intelligence Test)". 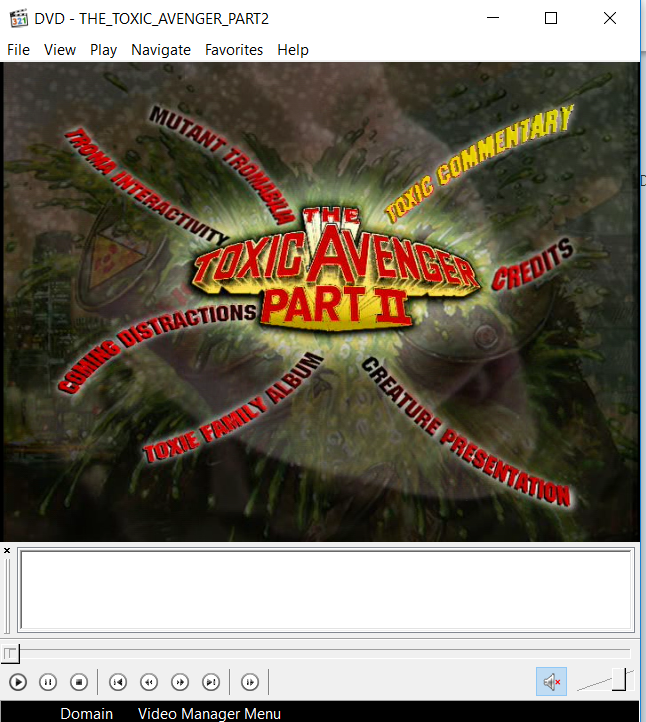 You forgot to list it in the extras for "Toxic Avenger 1" even though it is clearly in the menu picture you posted. Is this not an interactive quiz? If not, what is it? i am very soon giving up this one.. Please explain what is "Take T.I.T. (Troma Intelligence Test)". I've been asking this for some time and you are not answering. Is it a test/quiz? Is it a featurette? If it's not a test, it must be fixed for the Toxic Avenger 1 disc, and I need to enter it for the "Toxic Avenger 2" disc. If you explain and correct everything we can add this sooner. Don't try to make things more difficult than they already are. I will not add any more of your entries if you continue to list things with mistakes or missing information. So please fix this and help us with the updates. Another question. You list "Toxic Commentary (sub menu)" as a sub menu in the "Troma Interactive" menu, but I do not see it in your screenshots. Where it is located? And in the menu screen there is a "Toxie Family Album" but you did not list it in the specs. What is it? OK, Toxic Avenger 2 is now added. Now on to part 3. Do these featurettes have individual runtimes? Or is it Play All only? Could you explain what these extras are? For "Radar Men from the Moon" and "Undersea Kingdom", what are the names of the episodes? Is it "Moon Rocket" for "Radar Men from the Moon" and "Beneath the Ocean Floor" for "Undersea Kingdom"? Okay, Tox Box is now added. Thank you.